A number of years ago my next door neighbor’s son came to me and asked me to do the MS150 Bicycle Ride to Erie. It was dubbed the “Escape to the Lake” and it was a benefit for the National Multiple Sclerosis Society http://www.nationalmssociety.org It was a lot of fun and especially for a young 8th grader who had never ridden much outside of our local North Park. This ride is always well attended and supported and the fun thing that year was staying overnight in my freshman dorm up at Allegheny College in Meadville,Pa. As I walked around campus and stayed in the dorm, I thought to myself,” Did I really do this” It seemed like the distant past. As time went on, I opted for the camp out at Allegheny and also at Edinboro State University because I enjoyed the down time in my camp chair and sleeping under the stars in my dome tent. Always liked camping but I am the Lone Ranger when it comes to that sort of activity with my family. The neighbor kid eventually grew up and got married but I still kept up on the MS 150 until AAU Basketball got in the way of those weekends and I had to make a choice between being a good father in the stands at courtside or riding the MS. Fatherhood won out. But the MS Rides live on and they benefit research that is finding a cure for a very debilitating central nervous disorder. The money you raise goes to a worthy cause and you get a wonderful ride in the country with a well organized event as your reward. 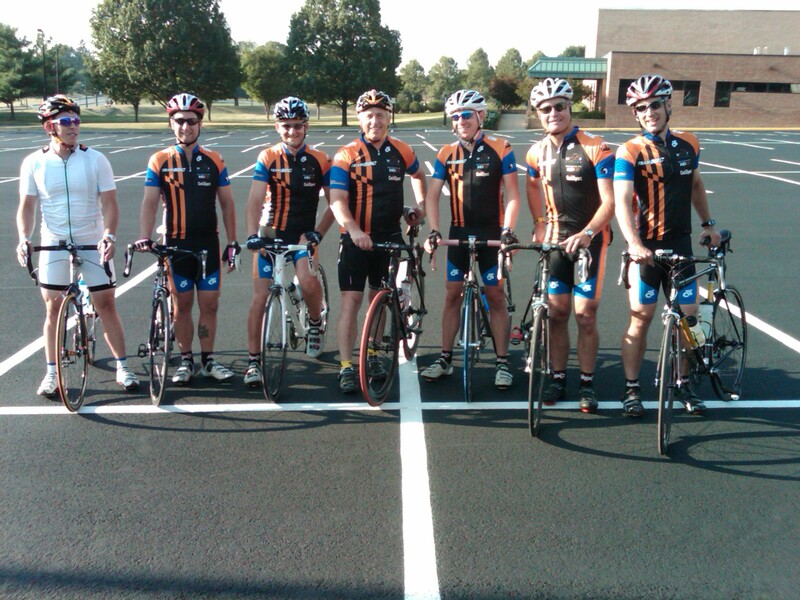 Several Maryland rides benefitted the 1-6 Organization http://www.1in6.org for men who were abused as children. This organization was supported by the Roz and Marvin Weiner Foundation as title sponsor with the honored guest being none other than our 3 time Tour de France champion Greg LeMond. 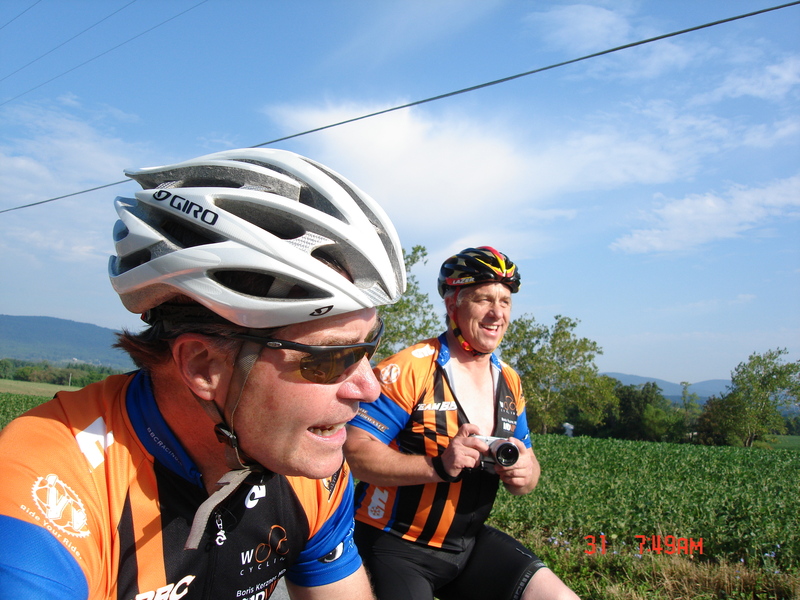 The interesting thing about riding with LeMond was that he is a very engaging person. The funny thing is that most of the people on the ride either did not know much about LeMond or had their own agenda on the ride so about 6 of us got to ride both days with the former Tour champion. The stories that he told on the road were amazing and the development of a lot of current companies involved in cycling equipment had their seminal influence from LeMond. Scott time trial bars, Giro Helmets, and countless others were entrepreneurial and research endeavors by LeMond. You learned a lot about world class cycling and the development of product by riding weekends with Greg LeMond. These were also camping events and my fix for the outdoors under the stars was satisfied in the Catoctin Mountains of Maryland. My friends Pete Hilton, Eric Durfee(the local) and Mike King and I rode in “America’s Most Beautiful Bike Ride” in Lake Tahoe one year which benefitted the Leukemia and Lymphoma Society. http://www.lls.org Riding a road bike around the most beautiful lake in the country surrounded by the Sierra’s is indeed breathtaking. This ride also supports a very worthy cause and riders come from all over the country to these events. My friend Tim Hamburger is very involved in this organization and if you are inclined to ride or support this organization, Tim would be appreciative. His countless hours of training riders for this event is exemplary and his volunteering spirit is appreciated by all of his riders and event organizers. This weekend, Maggies Marauder’s go into action at the MS150 Keystone Ride up in State College,Pa. Pete, JR, Cyndee and Barry, Don, and a bunch of my pals will take part in this ride that benefits MS. Maggie Schneider is dealing with MS and this group rallies around her as she rides to raise money for the issue that she deals with on a daily basis. 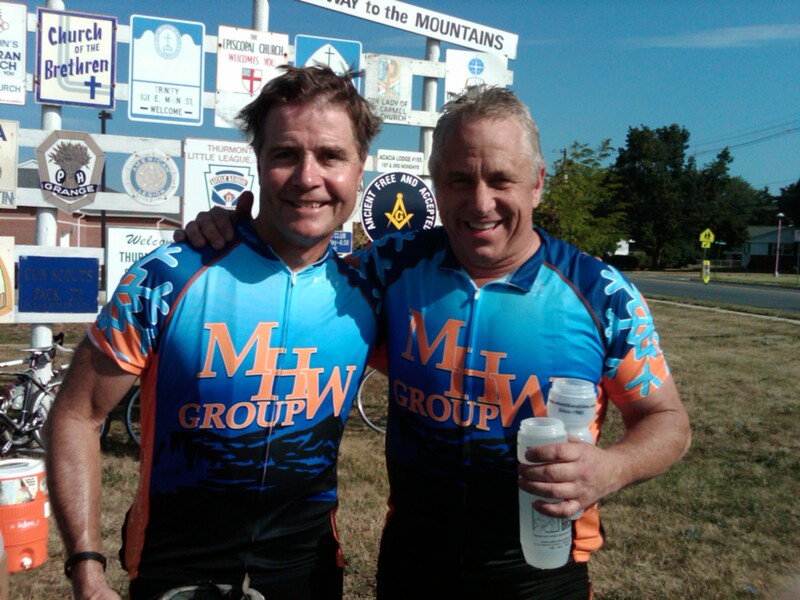 Consider supporing the Marauders who are led by team captain Bob DeZort and the memory of our friend Chip Kamin who helped found the group that rides in this event. Riding the miles for a cause is not only worthwhile and a really fun event to benefit a particular organization, but it is amazing to see the folks who can ride those kinds of miles. You have the experienced cyclists who ride a lot of miles and these events are not much of a challenge. But you see most of the people on less than adequate bicycles riding with a smile and making it to the end with folks scratching their heads and saying,” How could that bike and that person make it 150 miles?” You see the same thing at marathons and ask the same question. But the heart of individuals who have a goal not only physically but the goal to support their favorite cause is impressive. Please consider supporting these organizations, riders, and I encourage you to take part in these events if you have never done so. A worthy cause, riding a lot of scenic miles, camping under the stars( or hotel room if you prefer) great entertainment, good food, all make for an exciting weekend. Now that I don’t have the AAU Basketball excuse anymore because my baller is headed to college, I may have to make a return to the roads of the cause. Thanks for supporting and reading. This entry was posted in Uncategorized and tagged 1in6, American Culture, Bicycling, Cycling, Fitness, Greg Lemond, Health, Juvenile Diabees Research Foundation, Leukemia and Lymphoma Society, National MS Society, Outdoor Activities, Road Cycling, Roz and Marvin Weiner Foundation. thnx for the kind words…my email is SLIGHTLY different ie. pheffler@aol.com Heffler has 2 “F’s”..just like my report cards in grade school!!! Dan- thanks for following. I appreciate that you read this stuff. I am sure life is good out there. Love the pictures. Keep them coming. You made a good move to the West. Love reading about your charitable work Pat. Which guy in the picture won the tour? You look more fit! Very kind of you Hutch but there is only one Lemond. Actually there is a documentary you might want to view on ESPN next Tuesday night about Lemond and Bernard Hinault- Slaying the Badger. Check it out. It is on at 8:00. He is quite a guy and even though he is older and not near his Tour shape, he can still ride. Lots of them out there Mike as you know. Thanks.